Kajal is my blue Persian cat. He’s over 5 years old now and I always had problems with his coat. His hair gets so long and he doesn’t like when I brush him on his belly or chest. I try my best but some times his screaming gets over me and I just stop brushing him. I used to take him to a Cat Grooming Shop but the last time I did, they called me to come and pick him up earlier because he was getting too stressed and they refused to finish him. He’s usually very sweet and very affectionate but he cannot stand being groomed. It’s really frustrating because I know I cannot do it myself but also I cannot find someone that was willing to do it so his hair gets quite matted. I found Anita searching the web, and after reading the whole website I thought I would give it a try. “Maybe she can help me” I thought. I sent her an email, explained about the situation and she agreed to come over. She came, brought toys for him, her own grooming table, different brushes and clippers. She was so patient, calming and explained to me the best way to brush him. Kajal behaved much better than I expected. She had to pause a few times but not even once thought about giving up! When it came to do his legs, we both realised he would get over stressed and she suggested I took him over to the Vets in Notting Hill to finish him off under sedation. She took time to go there and finish Kajal herself instead of having the Vet doing it. 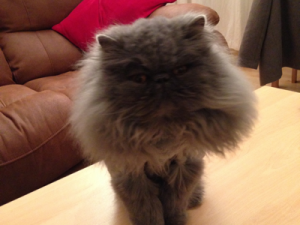 Kajal was happy with Catnips London cat grooming service and your cat will be too!